ISLAMABAD: Federal Minister for Information Fawad Ahmed Chaudhry on Thursday said that Pakistan has invited Saudi Arabia to become a partner in the China-Pakistan Economic Corridor (CPEC). The minister stated this while chairing a press conference in the federal capital following Prime Minister Imran Khan’s return to the country after a two-day visit to Saudi Arabia and United Arab Emirates (UAE). 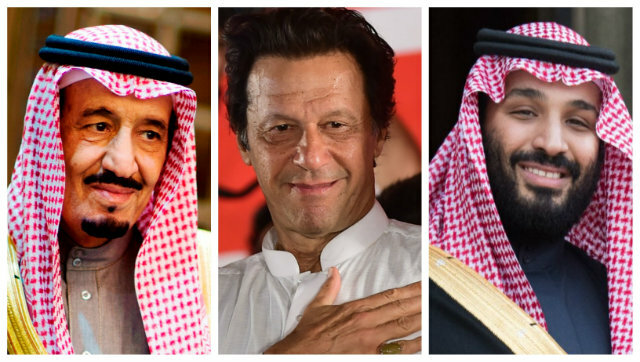 “A high-level coordination committee has been constituted [to look into matters of trade and commerce] and it has the complete backing of Saudi King Salman bin Abdul Aziz Al-Saud as well as the Crown Prince [Mohammad bin Salman] and PM Khan,” Fawad said, adding that the two countries had finalised the important economic partnership during the PM’s visit. He said that Saudi Arabia is the first country that Pakistan has invited to become a third partner in CPEC, and the projects that Saudi Arabia will be investing in will be worked out during the Saudi delegation’s visit, scheduled for the first week of October. “We expect major investments from Saudi Arabia,” he said. “Our strategic cooperation has been revitalised. We have assured the Saudi leadership that we will continue to provide security to their country and provide strategic support wherever needed,” Chaudhry said. He further informed that high-level delegations from Saudi Arabia and UAE will visit Pakistan next month to discuss trade and security. “I should mention here that Pakistan’s relations with Saudi Arabia and UAE had been frosty for the past few years but this visit changed that,” the information minister claimed. He added that the issues in the procurement of UAE visas will be resolved soon as it was one of the matters that had come under discussion during the visit. “The Foreign Office will soon send a proposal to UAE and it is expected that these issues will be resolved for the thousands of Pakistanis that are dwelling in the Emirates,” Chaudhry assured. The information minister said that UAE would also help Pakistan in various projects, including the provision of fresh water to Karachi. “Delegations from UAE will come to Pakistan in October to discuss these matters,” he said. “It is important to mention here that His Highness Muhammad bin Zayed has a great standing in GCC and Saudi Arabia, and his support will go a long way for Pakistan,” Chaudhry said. Speaking about Pakistan Muslim League-Nawaz (PML-N) supremo Nawaz Sharif’s bail on Wednesday and speculations that he had been let out on the request of the Saudi government, Fawad said that there was no truth to such rumours. “Nawaz Sharif is not so important that the Saudi government would put in a word for his freedom. In fact, let me assure you that no country has requested the government to grant Nawaz relaxation. There has been no deal and there will be no deal at any point,” he stated. “Those who say that the PM visited Saudi Arabia to cut a deal regarding the Sharifs don’t understand how the Saudis’ relationship is with Nawaz Sharif. They don’t understand where the Sharif family stands with the Saudis,” the information minister added. Furthermore, the minister said that the National Accountability Bureau (NAB) is a free institution. “We do not control it (NAB),” he said. Chaudhry also commented on the fact that the PML-N and its supporters had praised the judicial system after the verdict. “This is just bail, the case has not been put to rest, however, whatever loophole he used to get bail will be corrected,” he said, while adding “the important thing is that the country’s stolen money comes back, not that Nawaz stays in prison. He will be sent back to the same place where he was a few days ago. Our responsibility is to bring back the stolen money. Rest assured Nawaz will be a regular visitor at Adiala jail”. In response to a question, Fawad said that it was important to put the Sharifs in the Exit Control List (ECL) list. “Neither will we let Nawaz and Maryam leave the country nor will we let Ishaq Dar, Hasan and Hussain Nawaz stay abroad for much longer,” Chaudhry said, adding that the Sharif family will have to return the Pakistani people’s money back to them. Speaking about Indian Prime Minister Narendra Modi being contacted by PM Imran seeking a resumption of dialogue between the two countries, Fawad said that he was glad that the neighbouring country’s response has been positive. Earlier, the premier in his letter had called for a meeting between Indian Minister of External Affairs Sushma Swaraj and Foreign Minister Shah Mehmood Qureshi on the sidelines of the United Nations General Assembly (UNGA) in New York scheduled later in September.